Painting your wood fence protects your investment for years. Getting a wood fence was, as you probably know, a terrific investment. A well-maintained wood fence will last for years and can add an attractive design element to a home’s exterior. The key, however, is “well-maintained.” To maximize the life span of your wood fence, painting and upkeep are absolute requirements. Painting a fence isn’t difficult, but doing the job properly can be time-consuming and repetitive. The work is definitely worth it, however, as a proper paint job won’t just give your fence a face lift, it will actually extend the life of the fence by protecting it from the elements. Use good quality paint and primer formulated for outside use. It should contain UV inhibitors and should be designed to stand up to the elements. When choosing a paintbrush, it may seem like they’re all alike, but they really aren’t. 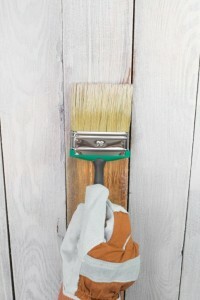 Cheap paintbrushes lose their bristles and have rough edges that cause blisters. Some are even badly out of balance and will be tiring to use. Spending a few extra dollars is well worth it to get the best out of your tools and get the best results for your wood fence. The time to start painting your fence is before it even goes up. Paint the boards, stringers, and posts before you build the fence. It’s a lot easier to paint fence boards lying in your garage than fence boards nailed up in your fence. Plus, this way you can easily cover all four sides. Don’t forget to paint or stain the ends of the boards as well, since the end boards are open-end grain that will be exposed directly to the elements. If left unpainted, moisture will easily work its way down into the boards, rotting them as it goes. If the wood fence is already installed, take some time to clean it up before painting. There are probably cobwebs, seeds, and who knows what else in the corners where the spreaders meet the posts. Clean these areas out with a whisk broom and cloth. Wash away any bird droppings on the fence with rubber gloves, a cloth, and a bucket of warm water. 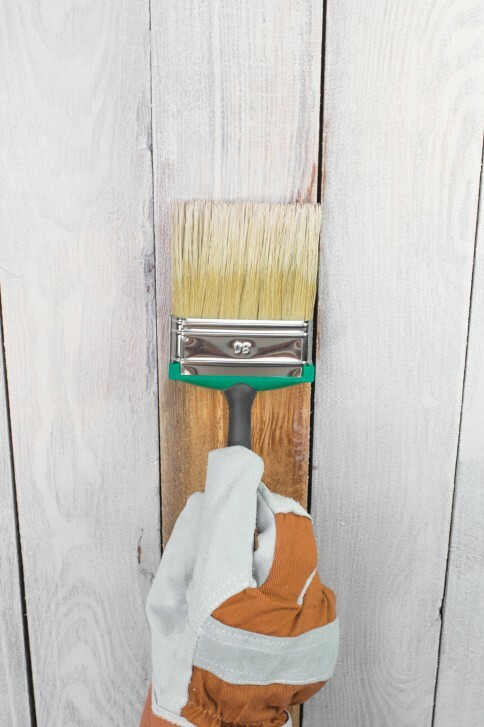 If any paint is flaking or loose, use a scraper or a wire brush to scrape it free. Excessive moisture from the atmosphere should also be considered and dealt with before applying primers and paints; covering mold or mildew is a bad idea. Check for any insect damage while you’re cleaning up. If you see any signs of termites, have an exterminator come in, or replace the boards that are damaged. Bare wood, particularly outside, should be primed before it is painted. Primer protects the wood and provides a better surface for the paint to adhere to. The methods for applying primer are the same as for applying the paint. Just be sure to let your primer dry completely before you move on. While you don’t need to be exceptionally careful when painting an outdoor fence, as opposed to an indoor wall, it still helps to follow a pattern or a process. Work on the fence one section at a time. About five boards per section is a good rule of thumb. This is important because when painting one side of fence and the center, paint gets on the face of the other side. If you wait until you are all done with one side of the whole structure, there will be dried lines or mounds of paint on the unpainted side, which you will have to scrape off. If you work on five boards on one side at a time, you can simply walk to the other side to clean up messy spots and to then paint that side of the section. This entry was posted on Wednesday, April 27th, 2016 at 3:47 pm. Both comments and pings are currently closed.